Travelling in Kosovo – Is it Safe? 3 Travelling in Kosovo – You should do it! Kosovo was a on our bucket list. As Aussies we had grown up with news of the troubles that had afflicted this region. We were curious to learn more of the history and stories behind these issues. As we traveled we learn’t that deciding the quality of a destination is not best done by listening to the news. Yes Kosovo has its problems and travelling in Kosovo is not without them but it is well worth the effort. To be honest travelling in Kosovo was easier than travelling in neighbouring Albania. Kosovo appears at least to the outside observer to have more commerce than Albania. The locals also appear to have a drive to make something of their country. This is not suggesting that Albania doesn’t. It just seems more evident in Kosovo. Kosovo does not run on all the same systems as Europe. It does operate on the Euro, but there are some differences that are really important. Bill Clinton advocated for Kosovo on the world stage. The locals love that he believed in them. In our opinion the locals want the rest of the world to believe in them. If you are driving your normal green card insurance (European Insurance Scheme) is not valid in Kosovo. You must buy local 3rd party insurance as soon as possible (Cost 15 Euro). You can generally do this at the border crossing. Be aware, this is not comprehensive insurance and only covers the other person not your vehicle! Many people ask us if we are crazy travelling in Kosovo or if it is safe. It is as safe as many of the countries that surround it. We had no troubles at all and never felt unsafe. The people are really nice and always keen to help. 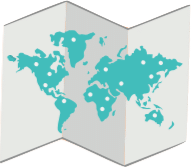 Check with your provider if Kosovo is covered under your policy. You should always have travel insurance – if you don’t get some now. Which makes access to money easier. Many travel money cards allow easy access and safe changing of your currency to Euro. You can then simply withdraw money from an ATM. There are lots of ATM in the cities and larger towns. Bus travel is easy especially from Pristina. It is also cheap and safe. Taxis are easy and cheap. Always abide by the golden rule of using the meter or agreeing a price before the ride starts. You can go from one place in the city to another for as little as 3 Euro. 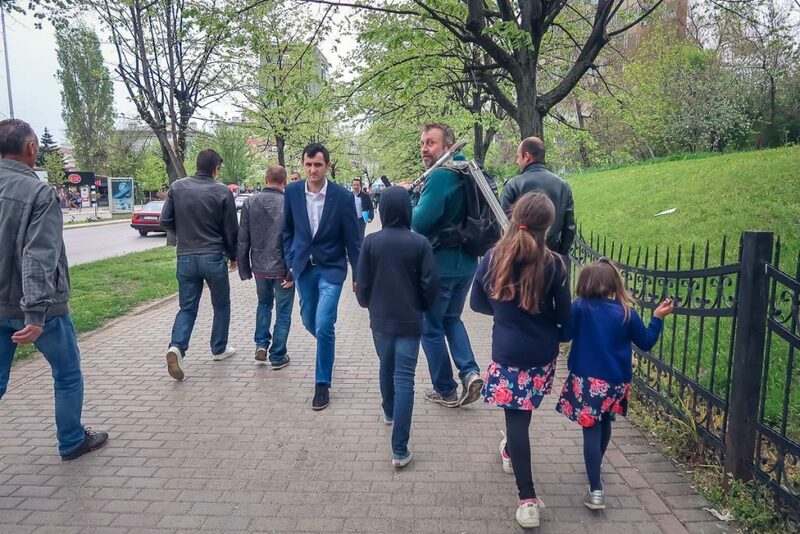 If you do drive, there are good parking facilities right in the city at the end of the boulevard Nene Tereza: This is the main walking boulevard or mall in the center of the city. It is right near the National Theater at coordinates: N42.6646526 , E21.1651155 It is cheap too. (We stayed here in our motor-home for 3 nights – no problems). There are still some tensions on the border of Serbia and Kosovo. Make sure you read the government commentary before going here. That said, you can expect to be met by international peace keepers at or near the border of Kosovo and Serbia. They will check your passports and turn you back if there are tensions and you don’t have a good reason to be there. There is a lot of beautiful countryside in Kosovo. Like all Balkan countries the countryside can be spectacular. WARNING: Stick to known paths and trails as there are still many un-exploded landmines. You must have your ownership documents with you to prove ownership or rental agreement (if it is a rent a car ensure you are allowed to take it into Kosovo). You must also purchase 3rd party insurance at the border for 15 euro. Although the locals drink it, the quality of the drinking water varies and the general recommendation is to buy bottled water if your unsure. We would recommend you get a filtered water bottle. We always recommend to either do a long walk to orient yourself or book in for a Free Walking tour. Our guide Astriti is knowledgeable and has good contacts with the sites. He got us into the Ethnographic museum on a Monday when it is closed. A walking tour in a small city like Pristina is really valuable. The Local guides get you into the city and help you see its fabric. Read More about the locals perspective here…. A snap shot of life in Kosovo in the past from ottoman times: It is difficult to find as it is in the back streets but provides an interesting snap shot of life in the past. It is closed on Mondays. The Ethnographic museum provides a picture of life hundreds of years ago. 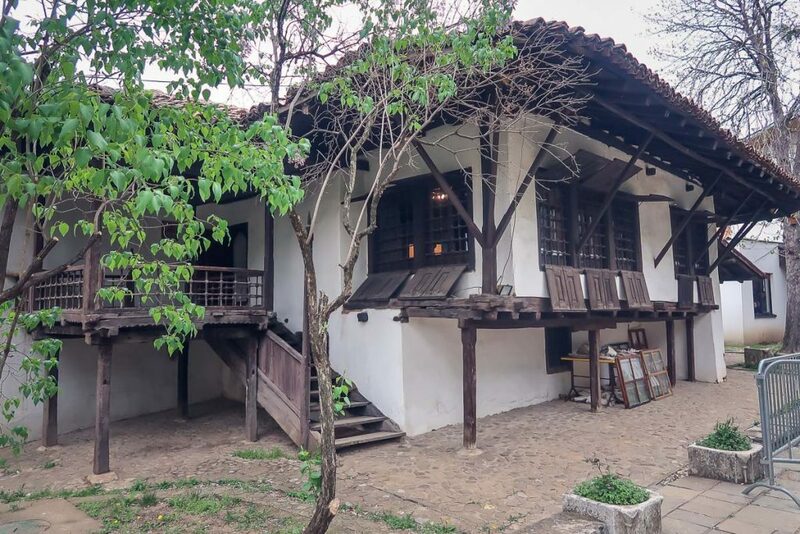 It was traditional home of a wealthy man shows the Albanian and Ottoman lifestyles. What? We want you to go to the library while travelling? The National Library is a polarizing building in Pristina. You either love it or hate it. Either way its worth a look. The Pristina National Library is a demonstration of progression. The original building was Yugoslavian in style. 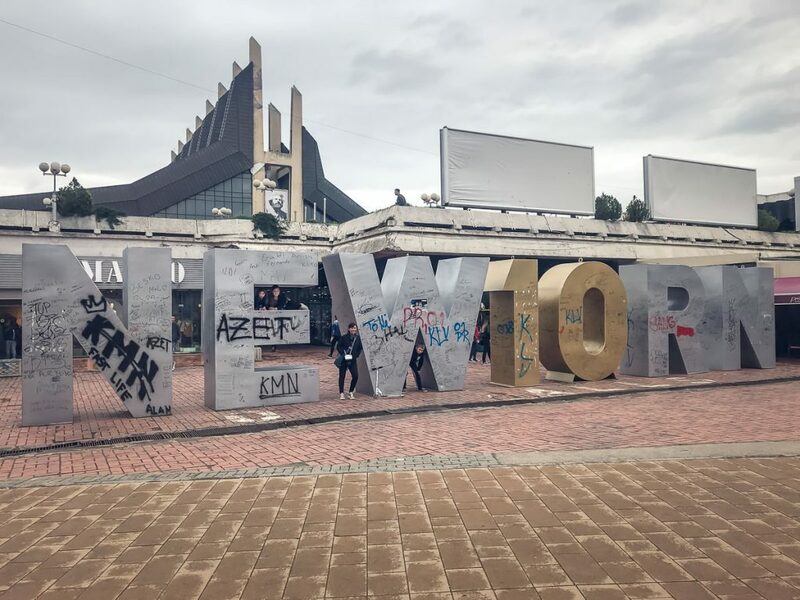 Kosovo has changed the style as a form of progress. 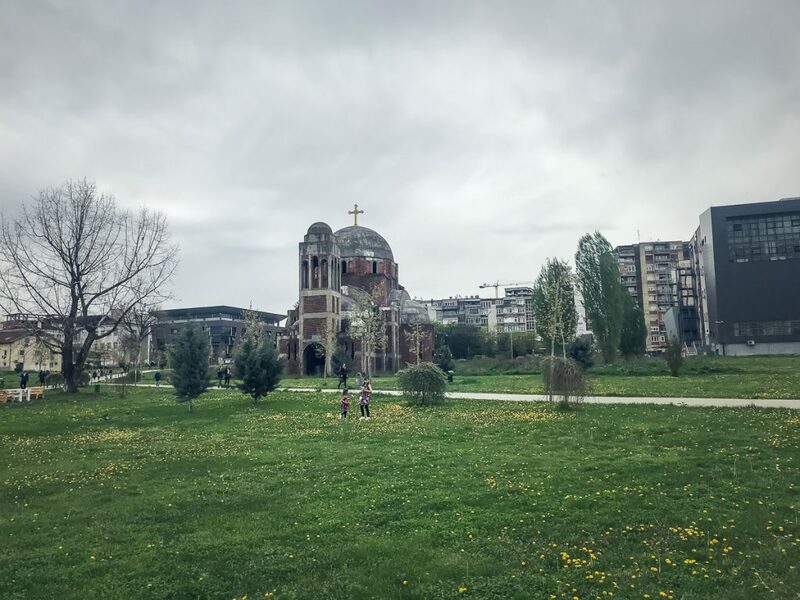 You can see the unfinished Serbian Orthodox church in the background. This Church was built by the Serbian Government. It is not finished but has not been pulled down. 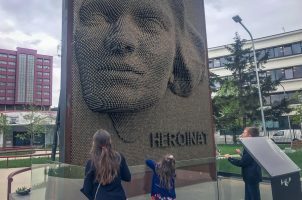 This monument represents the new nation of Kosovo. 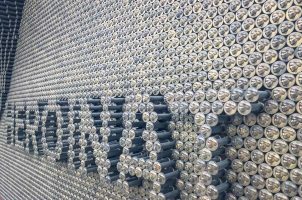 Although it is painted each year with a new theme it is covered in handwriting of people showing they have been there. My wife cried when we stood here and read the editorial of the Herionat monument. 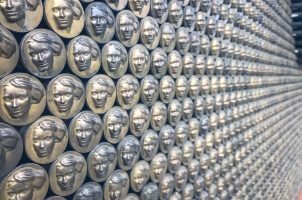 The monument to the pain of women during the war outlines and signifies some of the most difficult concepts of war. The damage done without using guns is significant and hard to deal with. Read the background of the monument here. It is difficult to find information on this topic that is not political. Skanderbeg Statue: Mother Teresa: and Bill Clinton. 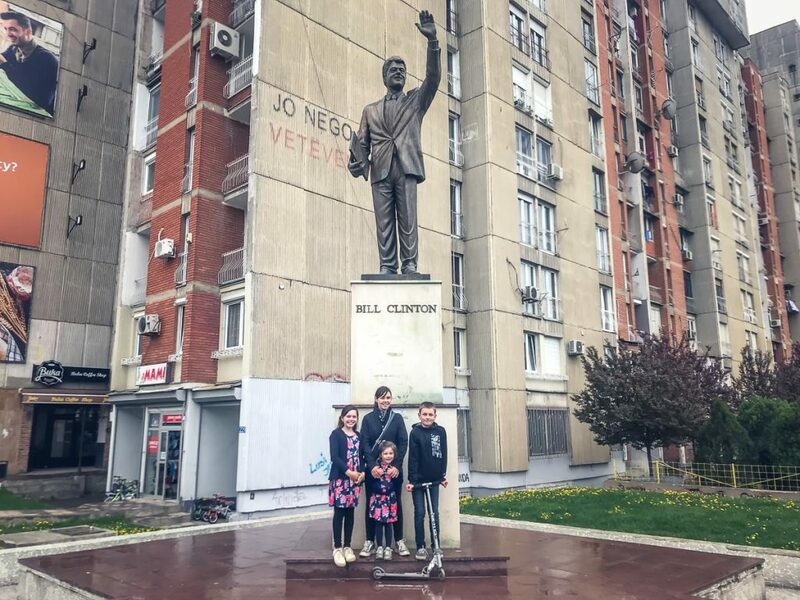 Travelling in Kosovo would not be complete without seeing the Bill Clinton statue. 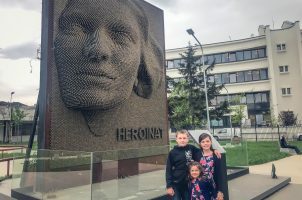 The statue is weird but it does highlight one of the culturally important aspects of Kosovo. It is easy to get to if you take a cab and ask the cabby to wait for 30 minutes. Should only cost about 10 euro round trip – Gracanica is a 700 year old UNESCO monastery and is worth the trip. Is a new Catholic church in Pristina. 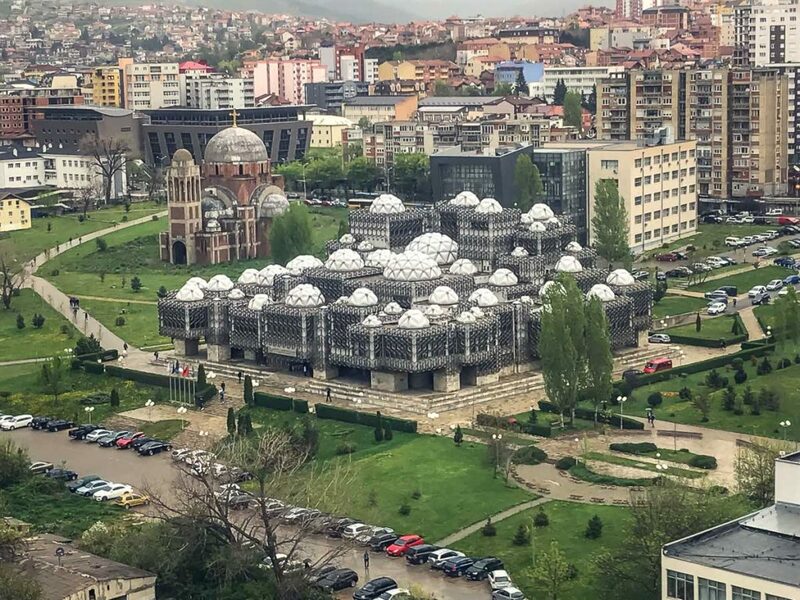 the Catholic faith represents a minority faith in Kosovo (Mainly Muslim) but the new church is huge with a tower that serves as a great way to get a view of the city. 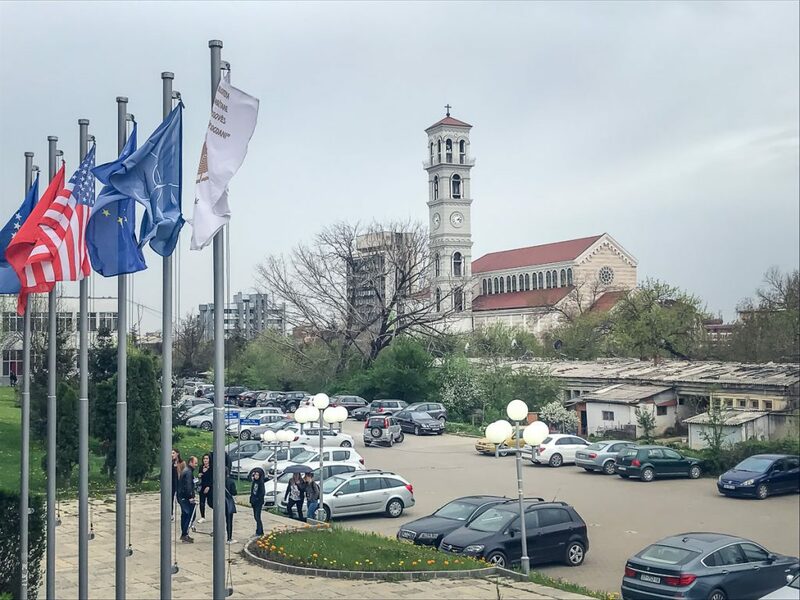 The Mother Teresa Catholic Church provides great views of the city and an insight into the Catholic Minority in Kosovo. Is one piece of green space in the city of Pristina. Crowds flood to the park in summer for a swim and all year round for hiking and some space from the hustle of the city. 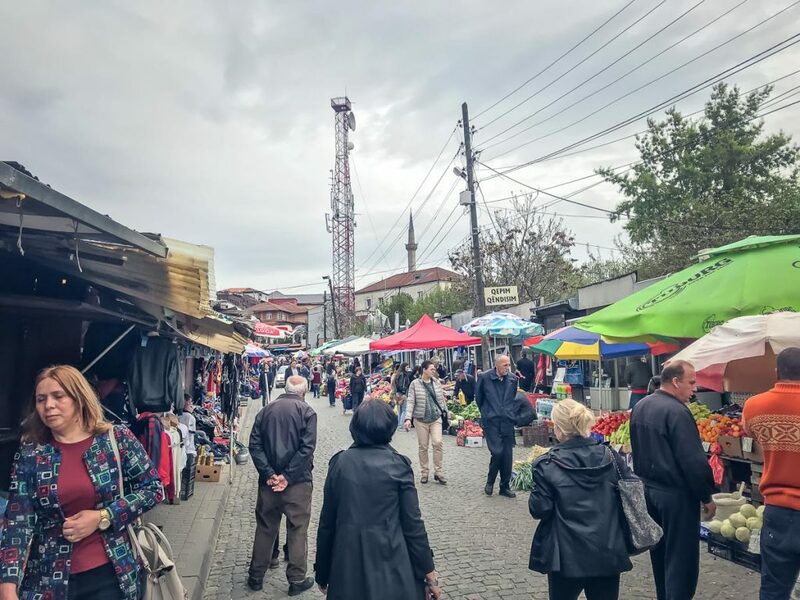 Take a short walk away from the main strip of Pristina to find the market area. There is plenty of fresh fruit and vegetables and local foods. Its a good way to spend an hour or two. The Old Town Bazaar is just away from the tourist area. It provides a great place to try local foods and buy fresh fruit and vegetables. 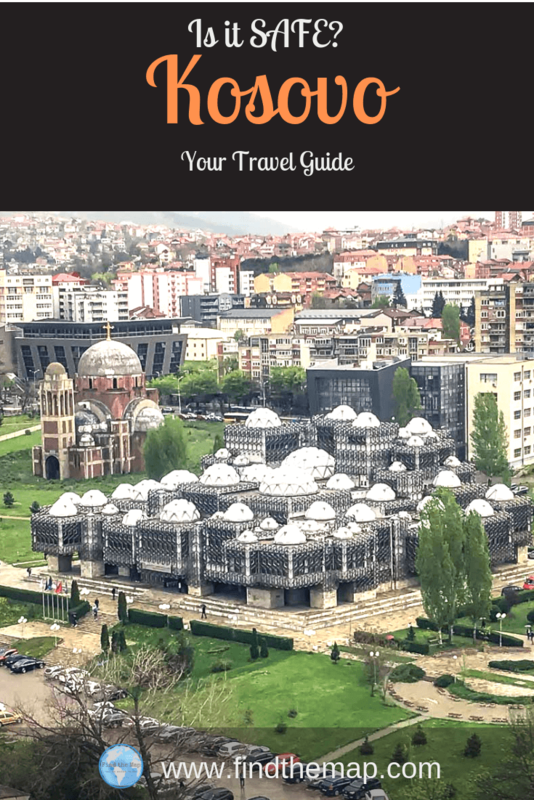 Travelling in Kosovo – You should do it! We found the people to be kind, open and helpful. The place is safe and interesting. The most important thing is to sit and hear stories from the locals. All of the activities above should be done with a view to sit and listen for a while and get a perspective that the news channels just wont give. Have you travelled to Kosovo? Let me know in the Comments what you thought. Found this Post helpful, why don’t you pin it to read again later! I loved this article about my country. The only thing I don’t really agree with is about the water. You can still drink it – locals do. Also, I am unsure about the Alexander the Great statue? Where is it? Great tip Lavdi. Good to know. We were told not to drink the water and I’m sure it was because we were travelling in our Motorhome and there weren’t many places to fill up our water tank. We ended up filling at Petrol Stations which is probably why we were advised to buy bottled water to drink. There is no statue of Alexander to Great, poor editing by me. The statue I was referring to was Skanderbeg Statue whos military skills where compared to Alexander the Great. I’ve fixed it now, thanks for pointing it out. 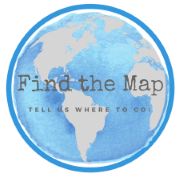 FIND THE MAP>Destinations>Kosovo>Pristina>Travelling in Kosovo – Is it Safe?